The homestead of James and Sophia Clemens is on Stingley Road west of Greenville, near the Ohio-Indiana state line. James Clemens, who was of mixed-race ancestry, bought 390 acres in 1818. James and Sophia Clemens’ barn still stands. A map dated 1857 shows landowners in the area. This undated hand-drawn map notes the many Native American settlements that were once in German Township, Darke County. 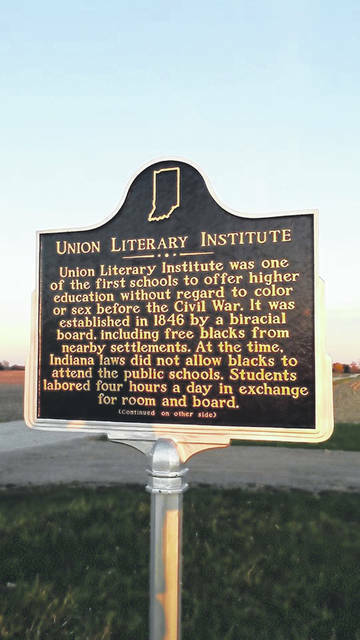 This Indiana Historical Bureau marker explains the Union Literary Institute, which was an educational system known for being open to African Americans before the Civil War. Public schools were not open at that time, and an education was difficult to achieve. It is at 8605 E. 600 South, Union City, Randolph County, Indiana. This location is just across the state line from the Clemens homestead. DARKE COUNTY — Founded two centuries ago in Darke County by a freed slave, Longtown became an island of tolerance in a sea of intolerance, a place where the races mingled, intermarried and generally just got along. Although the early settlers bore names like Clemens, Bass, Epps and Hurd, the community today bears the name of a family that came much later. The name of Longtown was derived from the Long family who arrived in 1884 after James Long bought a blacksmith shop sight unseen, “and on arrival discovered they were in a ‘colored’ community.” Undeterred, James and Sarah Long, who were white, stayed and soon became esteemed members of what was then known as the Greenville Settlement. So, when a name was needed for the new post office, the community settled on Long. “The name Greenville Settlement gave way to Longtown, or more properly ‘Long,’” Royer and Leavell wrote. More than six decades before the Longs arrived, records show that James Clemens was the first free black man to purchase land in German Township, as Liberty Township was known prior to World War I. In May 1846, with the help of anti-slavery Quakers from nearby Indiana, members of the settlement opened the Union Literary Institute in a two-story log house. Within a few years a dormitory was built to accommodate boarding students. The institute, also known as the Darke County Seminary, reached a peak enrollment of 90 students in one year before closing in 1910 because of dwindling enrollment. Among those who attended the school were Hiram Revels, who, in 1870, became the first African-American to serve in the U.S. Congress, representing Mississippi, and James Sidney Hinton, the first African-American to hold state office in Indiana. By the middle of the 20th century, the settlement’s population had dwindled to about 500 and, by 1980, the population was down to about 175. “One gets the impression on driving around Longtown Settlement today that there is ‘no there, there.’ There is no center. One finds a series of farms in the two square mile area, the Bass and Clemens cemeteries, abandoned buildings, along with some neatly maintained farmsteads,” Royer and Leavell wrote in their study. Although only a handful of families remain in Longtown, the community, with a larger population, lasted longer than other “integrated rural villages once scattered across the Ohio plains,” according to the Post. 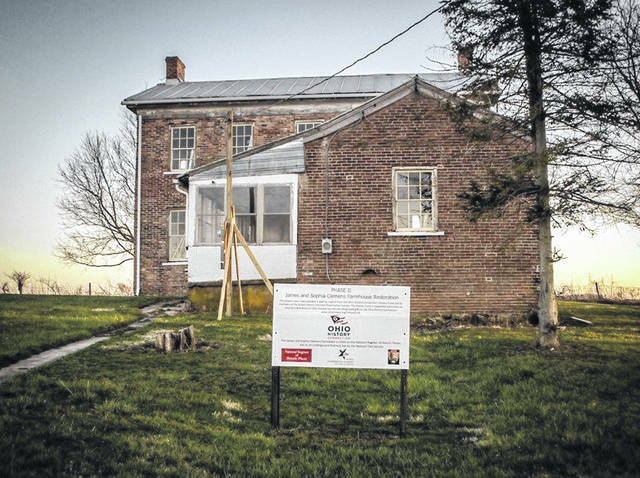 https://www.limaohio.com/wp-content/uploads/sites/54/2019/02/web1_house.jpgThe homestead of James and Sophia Clemens is on Stingley Road west of Greenville, near the Ohio-Indiana state line. 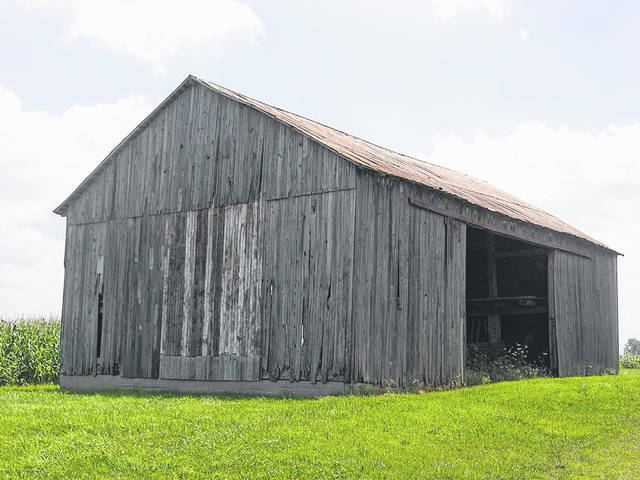 James Clemens, who was of mixed-race ancestry, bought 390 acres in 1818.
https://www.limaohio.com/wp-content/uploads/sites/54/2019/02/web1_1024px-James_and_Sophia_Clemens_Barn.jpgJames and Sophia Clemens’ barn still stands. 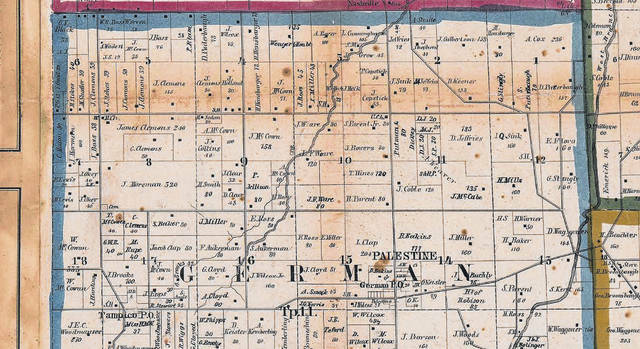 https://www.limaohio.com/wp-content/uploads/sites/54/2019/02/web1_1857-map-copy.jpgA map dated 1857 shows landowners in the area. 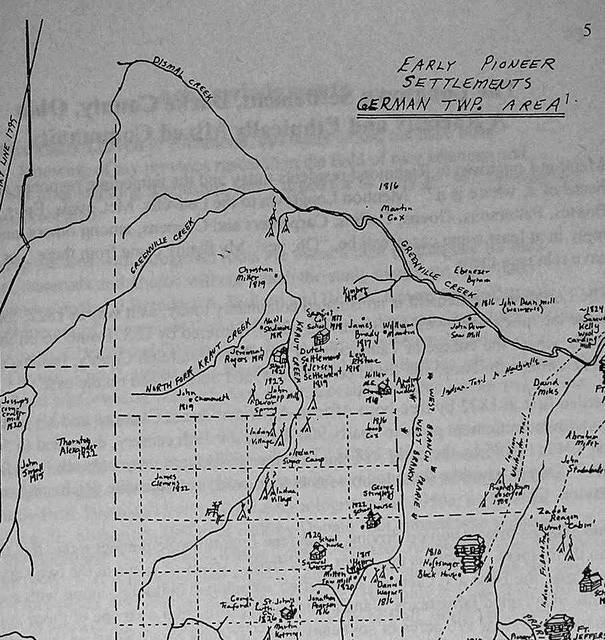 https://www.limaohio.com/wp-content/uploads/sites/54/2019/02/web1_map.jpgThis undated hand-drawn map notes the many Native American settlements that were once in German Township, Darke County. https://www.limaohio.com/wp-content/uploads/sites/54/2019/02/web1_Union-Literary-marker.jpgThis Indiana Historical Bureau marker explains the Union Literary Institute, which was an educational system known for being open to African Americans before the Civil War. Public schools were not open at that time, and an education was difficult to achieve. It is at 8605 E. 600 South, Union City, Randolph County, Indiana. This location is just across the state line from the Clemens homestead.